Restoring a leather jacket preserves historical and personal treasures. A leather jacket is an investment and proper care must be taken to ensure longevity. Follow these simple tips to ensure many years of wear from your leather jacket! Because unprotected leather is susceptible to water spotting and/or staining, we recommend the use of a water and stain protector. Always hang leather jackets on wide hangers (preferably, a wide padded hanger). Avoid using wire hangers. DO NOT store leather jackets in non-porous or plastic garment bags. Leather needs to breathe. If you store your leather jacket in your US WINGS garment bag, leave the bag unzipped or use a breathable garment bag meant specifically for the storage of leather jackets. If your leather jacket gets wet, allow it to air-dry naturally, away from any source of heat. DO NOT blow-dry or place in front of a heater or fireplace to speed the drying process. If needed, you may apply some leather conditioner when the leather is dry to restore flexibility. Wrinkles should fade away while the jacket is on the hanger. We DO NOT recommend ironing. However, if ironing is absolutely necessary, set the iron to the lowest setting, place heavy paper (like a brown paper bag) over the area to be ironed, and keep the contact short and quick to prevent burning or shine. Use the iron “dry” — NEVER use steam. During the winter, salt deposits should be promptly removed from your leather jacket with a wet sponge, followed by air-drying and conditioning (if needed). Avoid excessive humidity to prevent the growth of mildew. If you live in an unusually dry environment, use leather conditioner regularly to prevent the leather from drying or cracking. DO NOT place adhesive stickers or tape onto your leather jacket; the adhesive may ruin the jacket’s finish. 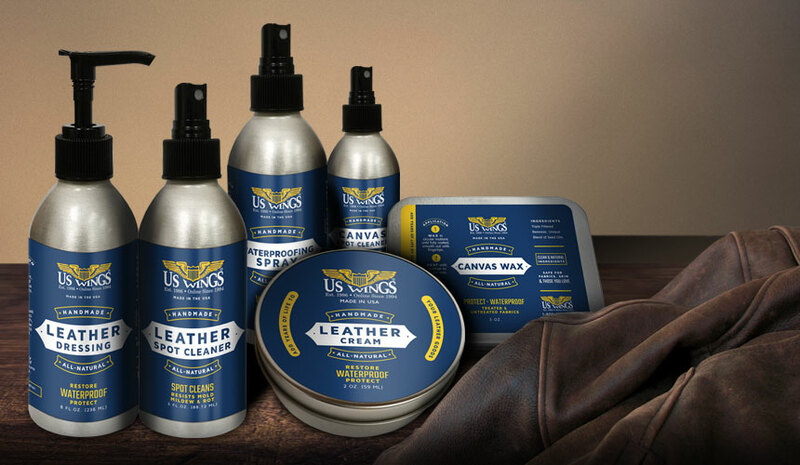 Add the US Wings leather care products to your cart to ensure the protection and longevity of your leather or canvas jacket.